Did you know that SM Carriedo is the first ever Shoe Mart (the SM malls that we know) in the Philippines? When I was still residing in Manila, I never fail to visit this branch since it became an outlet store for the brands you usually see inside every SM Department Stores. And one of the brands that I love to shop at SM Carriedo is GIBI Shoes. The reason is that normally, the price of their shoes in Carriedo are always discounted. I even bought a pair of stilettos there for only P300.00 (originally P1000.00+)! I've never visited that branch for years, but I'll put that in my schedule so I can share with you some great deals that I can see there. I bought this pair of green sandals in 2010. It is still in good condition currently. But I'll be honest, I only wore it a few times since it is not really that comfy to wear. The buckle part of the sandals is not that friendly to my feet. But this pair serves it purpose when doing outfit shots, which I will be sharing with you within the week. By the way, I only paid P700.00 for this pair. I still love the color though (you already know why :p). Have a great day! Also, its a lovely shade of green. 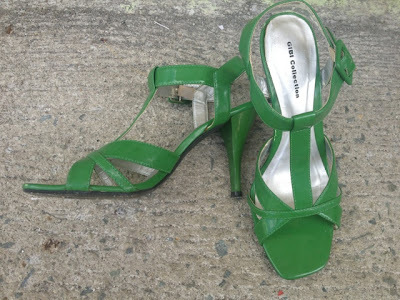 Been looking for a green pair of shoes in Jakarta for a while, to no avail. hello!thanks for dropping by :) I like your blog btw. hope you'll find a nice pair soon. good day!